← Who should pay for infrastructure? Inventory remains very low for this time of year. 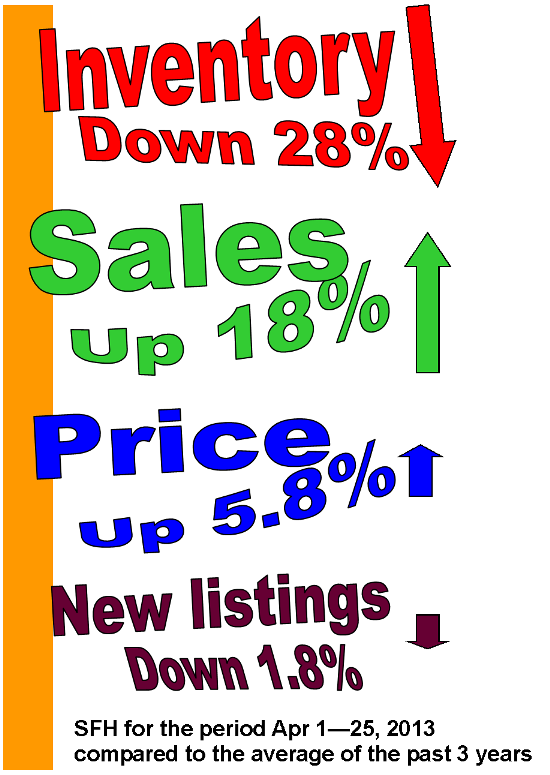 New listings are up 6.4% compared to last year. Buyers were waiting for them, however, and sales are up 6.1%. When the average SFH price goes to 600,000, I think I’ll give you a call. CMHC reported yesterday that new home construction in Edmonton continues to plow ahead, with total housing starts up 29% in the first quarter of 2013 compared to 2012. The report discusses economic trends including employment and migration in the Edmonton area. First quarter employment dropped slightly from the end of last year, but was still up over the first quarter of 2013. Our labour market outperformed most of Canada in the first quarter, and the unemployment rate dropped to 4.2% from 4.5% in Q4 2012. As we’ve already discussed on the blog, migration into the province was very strong in 2012 when net migration reached 85,978 people, more than doubling the 2011 tally as well as reaching a record high. I’ve yet to see any population stats for 2013 but will post them when I find some. … prices continue to rise in Edmonton….